Christian Hebraist; born at Leipsic Feb. 23, 1813; died there March 4, 1890. He was not of Jewish descent; although, owing to his rabbinical learning and his sympathy with the Jewish people, and from a misunderstanding of his relation to his Hebrew godfather (whom he called "uncle"), a Jewish ancestry was often attributed to him. He devoted himself early to Semitic studies, was made assistant professor at Leipsic in 1844, and was called as professor to Rostock in 1846, to Erlangen in 1850, and in 1867 to Leipsic, where he spent the remainder of his life. His services to Hebrew philology and literary history and to Biblical exegesis were great. As an Old Testament critic he was progressive: beginning as a bulwark of conservatism, he gradually moved toward the modern position (for example, in regard to the documents of the Pentateuch, and the dates of Deuteronomy, Isaiah [xl.-lxvi. ], and Daniel). In Biblical psychology his work was less satisfactory, and has not met with favor. As a student he became deeply interested in post-Biblical Hebrew literature, and even his Biblical commentaries are full of citations from rabbinical and Neo-Hebraic works. In 1837 he worked out a catalogue of the Hebrew and Syriac manuscripts in the Leipsic Rathsbibliothek (published 1838). In conjunction with Steinschneider he edited and annotated Aaron ben Elijah's '"Eẓ, Ḥayyim" (Leipsic, 1841); though his chief work in this branch was his "Zur Geschichte der Jüdischen Poesie" (Leipsic, 1836), a history which is still of use. Mention should also be made of his "Jüdisch-Arabische Poesien aus vor-Muhammedanischer Zeit" (Leipsic, 1874); "Jesus und Hillel" (3d ed., 1879); "Jüd. Handwerkerleben zur Zeit Jesu" (3d ed., 1879; Eng. transl. "Jewish Artisan Life," London, 1877); and his edition of Weber's "System der Altsynag. Theologie" (Leipsic, 1880). 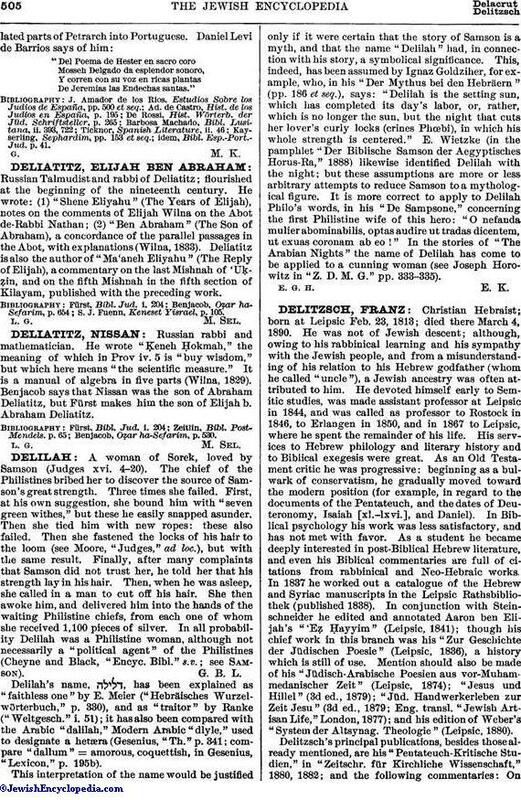 Delitzsch's principal publications, besides those already mentioned, are his "Pentateuch-Kritische Studien," in "Zeitschr, für Kirchliche Wissenschaft," 1880, 1882; and the following commentaries: OnGenesis, 1852, 1853, revised ed., 1887; Job, 1864; Isaiah, 1866, 1889; Psalms, 1867; Proverbs, 1873; Song of Songs and Ecclesiastes, 1875. These commentaries, though they follow the Masoretic text without attempt at emendation, are exegetically strong. Delitzsch was also active in other lines of Biblical science. He took part in the revision of Luther's translation of the Bible, instituted by the government of Saxony in 1873; he collaborated with Baer in the publication of a revised Masoretic text of the Old Testament (the Baer-Delitzsch text, unfortunately left unfinished); and, in connection therewith, produced a series of studies (from 1871 to 1886) on the Complutensian Polyglot. Delitzsch was a vigorous opponent of the anti-Semitic movement in Germany, and was one of the foremost opponents of Rohling, defending the Jews against the blood accusation. In 1841 he made a public declaration on this subject in the Waisenhaus-Kirche in Dresden, and in 1882 published a responsum ("Christliche Zeugnisse Gegen die Blutbeschuldigung," p. 12). In this connection he wrote "Rohling's Talmudjude" (7th ed., 1881); "Was D. Aug. Rohling Beschworen Hat?" (1883); "Schachmatt den Blutlügnern Rohling und Justus" (2d ed., Erlangen, 1883); "Neueste Traumgeschichte des Antisemitischen Propheten" (Erlangen, 1883). This did not prevent him from repelling what he considered unjust attacks upon Christianity in the Jewish press ("Christentum und Jüdische Presse," Erlangen, 1882). 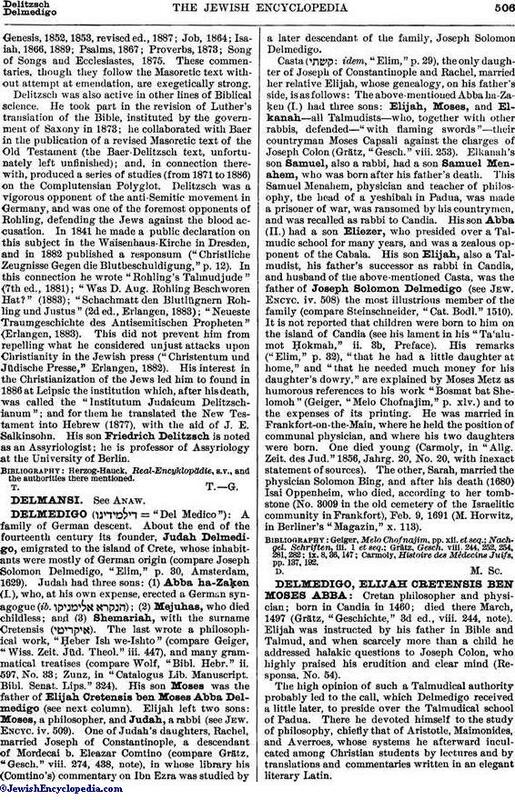 His interest in the Christianization of the Jews led him to found in 1886 at Leipsic the institution which, after his death, was called the "Institutum Judaicum Delitzschianum"; and for them he translated the New Testament into Hebrew (1877), with the aid of J. E. Salkinsohn. His son Friedrich Delitzsch is noted as an Assyriologist; he is professor of Assyriology at the University of Berlin. Herzog-Hauck, Real-Encyklopädie, s.v., and the authorities there mentioned.